Pazit Kahlon-Shelnutt received her B.Ed. (2000) from "Seminar Hakibutzim" Educational College in Tel-Aviv, Israel. She received her M.A. (2008) in Education and Judaic Studies from Siegel College, Cleveland, OH. Pazit started teaching Hebrew at Emory in 2014. In her classes she engages students in activities that expose them to the Hebrew language and Israeli culture. Pazit is using the Hebrew-proficiency approach, by "Hebrew at the Center" in order to develop the four main functions of language: oral expression, reading, writing and listening by making the learning relevant and in context to students’ life. For the last 14 years, Pazit taught Hebrew and Judaic studies at "The Epstein School" and "Greenfield Hebrew Academy" Jewish day schools in the Atlanta community. She also taught "Ulpan" classes for adults at the MJCCA, Atlanta. In 2005 Pazit took part in developing the "Tal-Am" curriculum, which was launched in 2009 and was well adapted to Jewish day school around the globe. 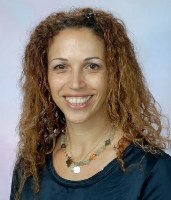 In 2012 she led the BYOT (Bring Your Own Technology) pilot and program at "The Epstein School". Using the technology on daily base and linking it to the existing Tal-Am curriculum.